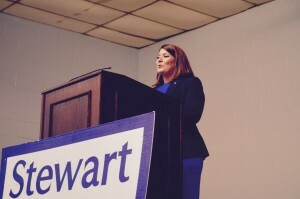 NEW BRITAIN — Mayor Erin Stewart focused on finances, economic development and compassion as she kicked off her campaign for a second term before a crowd of about 300 Tuesday night. The administration also “reduced city spending by more than $16 million, and I have now presented two consecutive annual budgets that are both honest and balanced,” she said. On the economic development front, the city native said, “Back in 2013 the only shovels in the ground in New Britain were being paid for by taxpayer dollars. Today, we have a laundry list of private development projects both large and small.” The mayor noted Costco “is on track to open this fall” and that the Berkowitz Building, one of the city’s most well-known eyesores “is about to undergo a major renovation.” She also talked about the former Guida property on Farmington Avenue, which is being developed into a 126-bed senior living facility, a gas station, Dunkin’ Donuts, a restaurant and dairy barn. The Democrats have not yet put up a candidate to challenge the mayor. Only Al Mayo, a petition candidate, has announced his intention to run for mayor.